How Is Produce Classified Under the Produce Safety Rule? What Are the Requirements for Small and Some Medium Scale Farms? How Do GAP Certifications Compare to FSMA’s Produce Safety Rule? Good Agricultural Practices (GAPs) are the basic environmental and operational conditions necessary for the production of safe, wholesome fruits and vegetables. The purpose of GAPs is to give logical guidance in implementing best management practices that will help to reduce the risks of microbial contamination of fruits and vegetables. Examples of GAPs include worker hygiene and health, manure use and water quality throughout the production and harvesting process. While the United States has one of the safest food supplies in the world, recent media attention on foodborne illness outbreaks underscores the importance of good agricultural practices. Growers, packers and shippers are urged to take a proactive role in minimizing food safety hazards potentially associated with fresh produce. Being aware of and addressing the common risk factors outlined in GAPs will result in a more effective, cohesive response to emerging concerns about the microbial safety of fresh fruits and vegetables. Furthermore, operators should encourage the adoption of safe practices by their partners along the farm-to-family food chain. This includes distributors, exporters, importers, retailers, produce transporters, food service operators and consumers. North Carolina’s fresh produce safety efforts are broad and diverse, positioning the state as a national leader in food safety education and outreach. This website represents the “N.C. 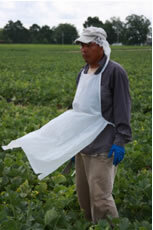 Fresh Produce Safety program,” part of the Department of Horticultural Sciences at NCSU. This website is managed by Elena Rogers and Chip Simmons, Area Specialized Agents in Food Safety- Fresh Produce. The N.C. Fresh Produce Safety Task Force minimizes food safety risks and enhances the economic competitiveness of North Carolina’s fresh produce industry. North Carolina State University – Cooperative Extension, including the program areas of Agriculture and Natural Resources and Family and Consumer Sciences, the Departments of Food, Bioprocessing and Nutrition Sciences; Horticultural Science; Agricultural and Resource Economics; Biological and Agricultural Engineering; and 4-H Youth Development and Family & Consumer Sciences. North Carolina A&T State University – Cooperative Extension, Departments of Natural Resources and Environmental Design, and Family and Consumer Sciences. North Carolina Department of Agriculture and Consumer Services – North Carolina Food and Drug Protection Division and Marketing Division.